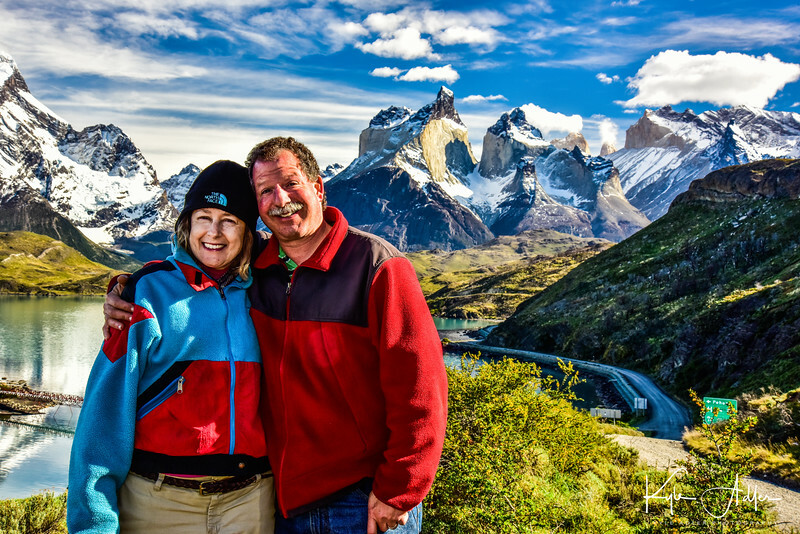 Several times in the pages of “To Travel Hopefully,” I’ve emphasized the importance of including yourself and your travel companions in some of your images. Not only will you and your friends enjoy seeing yourselves captured in these travel photos, but the inclusion of people in travel images gives a sense of scale to the places you visited and tells a more compelling narrative than would be possible in photos without people. The standard way of including yourself in a photo these days is to use your phone’s selfie camera, but there are a number of reasons why taking selfies is not the best way to capture your own likeness in an image. First, the sensor in the front-facing (“selfie”) camera on your phone very likely has a much lower resolution than does the phone’s regular camera, so the picture quality is lower. Second, it’s difficult to properly compose a photo when holding the camera out at arm’s (or selfie stick’s) length, let alone to smoothly release the shutter. Third, the perspective imparted to the image when the camera is held above in selfie fashion is distorted and often unflattering. It’s really quite unlikely that you’ll get professional quality images of people using the selfie technique. Fortunately, there are better ways of including yourself in your photos, and they’re not difficult to implement. The two most straightforward methods are placing the camera on a tripod and triggering the shutter with a self-timer or remote release, and setting up the camera for another person to shoot handheld. The basic setup is the same for either method. Have the other people you want included in the photo stand in the desired location. If you’re the only person present, make a note of where your body will be placed in the composition. Then compose your image from the best vantage point, with the camera either mounted on a tripod or handheld. Configure your camera’s settings (focus, exposure, flash, etc.) the way you prefer, and test the settings by shooting a few frames without yourself in the image. Then move into your predetermined position in the frame and either fire the shutter remotely with the self-timer or remote release, or ask another person to push the shutter button for you. If you do choose to have another person press the shutter release button for you, you need to be thinking about two things: 1) ensure they know how to operate the camera and won’t run away with it, and 2) be aware that in many countries and regions the person who pushes the button owns the copyright for the image even if they did not contribute artistically to making it. I prefer to use a tripod and remote release whenever practical, so as to have a higher likelihood of capturing the image I envision and to avoid any question as to who owns the copyright. Do you have a favorite method for including yourself in your photos? Please share your ideas in the comment box. Want to see more posts on how to shoot while traveling? See them all here: http://www.to-travel-hopefully.com/category/travel/shoot/. If you do choose to have another person press the shutter release button for you, you need to be thinking about two things: 1) ensure they know how to operate the camera and won’t run away with it, and 2) be aware that in many countries and regions the person who pushes the button owns the copyright for the image even if they did not contribute artistically to making it. I prefer to use a tripod whenever practical, so as to have a higher likelihood of capturing the image I envision and to avoid any question as to who owns the copyright.